The Bucas Quilts are super versatile stab signs that can be used alone or as an extra layer under a Bucas-Turnout or Bucas-Stable. The Quilt neck is available to complete the blanket but is also sold separately. 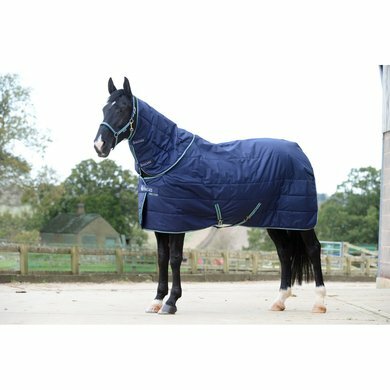 The Bucas Quilt Big Neck is a great blanket for stallions and breeds with wide shoulders such as Frisian, Andalusians and Fjords. 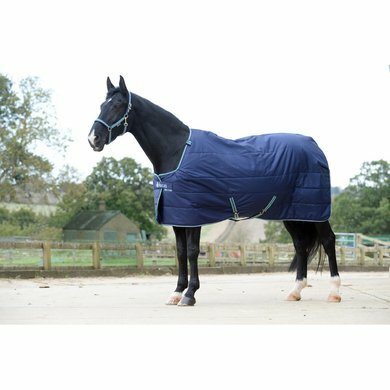 This blanket is 150 grams lined and has a Stay-dry (SD) lining that can be placed on a wet horse. The Stay-dry material will drain the moisture faster and helps to dry the horse faster. Attachment points for use with Bucas Turnouts or Stable Signs. Good blanket! Had ordered a bigneck because I found the normal small to fall out. Bigneck, however, was too big. Super nice with stay-dry! Only the neck is very small and tight, even the bigneck while I have a normal horse with some front. Better size bigger if you doubt. The system of a loose under blanket is useful in spring and autumn. The underblanket is very warm and also suitable for the winter. Beautiful blanket, but because of my reading error? not correctly purchased. I thought that 'big neck' stood for a more covered neck. But it is for horses types with a strong front. Such as Frisians, Tinkers, Haflingers. That should have been more clear with the description. For my slender horse so far too wide so the blanket moved very far back and gave chores to the neck and chest. Because it is a under blanket you do not have a direct view of it. Unfortunately. Normally I am very satisfied with Bucas. Answer: The Bucas select bottom blankets are just as suitable for the Bucas Power Turnout blankets. Question: Has the neck been delivered? Answer: This blanket is delivered without a neck.